Scooters come in different sizes, colors, models and shapes. Very many companies in the market deal with scooters and it is possible to come across very many brands of these gadgets. With the so many options to choose from, sometimes it becomes very hard to know what to buy and what not to buy. Although most people rely on the dealers to tell them the best mode of the scooter to buy, it is important to note that, not all that your dealer tells you about that scooter is true. After all, the dealer is out there to make money and hence may give you some biased information to make you buy that scouter. It is therefore very important to do basic background research on the various types of scooters in the market, their efficiency, use, and durability before you go out to purchase or look for that dream scooter. It is with this in mind that we have decided to write this very informative and enlightening piece on Razor A3 Kick scooter review to enlighten you and to let you know the features, pros, and cons of this scooter as you go out to shop for your favorite scooter. Razor manufacturers razor A3 Kick scooter manufactures and can be said to be an updated version of the initial Razor Kick scooter. 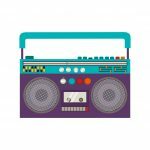 This gadget is suitable for anyone above five years of age and hence can be bought as a gift for your kid. It has been equipped with large wheels of one hundred and twenty-five millimeters. This is a relatively large size of wheels as compared to its predecessor version. It also has ABEC-5 bearings which allow the user to have smooth and efficient rides. The bearings also allow this gadget to travel at a very high speed. Razor A3 Kick scooter has a front fork that has shock absorbing capabilities that make it outstanding among the other types of scooters. Shock absorbing front fork– Razor A3 Kick Scooter has a front fork that is equipped with a shock system that does not use a spring. This shock absorbing feature of the front fork makes this scooter one of the few unique and preferred modes of the Razor models. This is because bumpy or rough surfaces are made to feel smoother, and you don’t struggle to ride over these surfaces. Patented folding capabilities– Razor A3 Kicker has a patented folding mechanism that makes it possible to fold your scooter. This means that, with this scooter, you can fold it into a compact and portable size. Riders usually love parking this scooter into a bag when traveling for long distances and don’t want to leave their scooters behind. ABEC-5 bearings system– Razor A3 Kick Scooter has a system of ABEC bearings which have very high-speed capabilities. This means that this scooter can move at very high speeds that cannot be easily matched by any other type of scooter. This feature also allows you to enjoy a smooth ride which is very efficient and reliable. Rear fender brakes– Razor A3 Kick scooter is equipped with a rear fender brake system which enables the rider to stop quickly, especially during emergencies. This feature makes this scooter a very simple gadget to operate, and chances of accidents and damages are minimized. Has adjustable handlebars– Razor A3 Kick scooter has an adjustable handlebar system that allows you to adjust and set the height of the scooter. This means that this scooter can be used by almost anyone without considering their heights. This also means that this scooter is very suitable for kids as you don’t have to buy another scooter when your kids grow up. You simply adjust the height to fit that of your kid. Aircraft grade aluminum– Razor A3 Kick scooter is made up of aircraft grade aluminum that makes it very strong and also very durable. This also enables it to carry heavy weights and also allows it to withstand rough handling and exposure. Easy to handle and carry around– It is very easy to carry and handle the Razor A3 Kick scooter. This is so because it has been equipped with a patented folding system that allows you to easily fold and pack your scooter allowing you to carry it easily. Carries a significant weight– Razor A3 Kick scooter carries a maximum of around 143 pounds of weight. This means that this scooter is not only suitable for young kids but can also be used to carry big and heavy people. 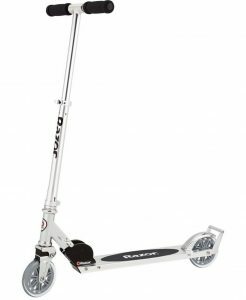 Durable– The Razor A3 Kick scooter is made of aircraft grade aluminum which is very durable and quality material. This makes this gadget very reliable and durable and can serve you for a very long time. This means reduced costs in replacing or repairing of this device. 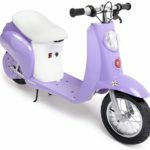 Suitable for young kids– This scooter is suitable for both young kids and also the adults. This means that you can buy one of this scooter to be used by the whole family. It is made more reliable by the adjustable handlebar system that makes it possible to adjust the height of your scooter depending on the height of the user. The main shortcoming of this scooter is that one can experience challenges when folding and also when unfolding this scooter. However, with some experience, this challenge can be overcome. Razor A3 Kick scooter is a very efficient, durable and reliable type of scooter. It is suitable for your basic traveling needs and can also be used when having fun with your family and your kids. It is one of the few scooters that can be carried around with ease hence making it a very popular scooter among people worldwide. If you are thinking of buying a scooter that serves your needs, then maybe it is time you considered the Razor A3 Kick scooter!